Is Pomegranate Juice Good for Diabetes? Pomegranates are healthy fruit which offer great nutrition for diabetics and healthy people alike. Pomegranate juice too is a source of important nutrition and studies show it may hold blood sugar lowering effects which may benefit diabetics, but most importantly it is believed to offer a certain level of protection against developing diabetes type 2 in the first place. But pomegranate juice effects on diabetes are much more complex than just this one benefit. For example, the juice concentrates significant amounts of simple sugars and at the same time lacks fiber, fat and protein which could slow down their absorption. Drinking even moderate amounts of pomegranate juice with diabetes can easily cause spikes in blood sugar levels, meaning that the juice is not actually very good for diabetes after all. Pomegranate juice nutrition is something to consider very carefully when deciding to introduce the juice into a diabetic diet. For the most part, medical professionals and nutrition experts currently advise against drinking pomegranate juice with diabetes. How is pomegranate juice bad for diabetes? 1) First, because of the moderate to moderately high glycemic index (GI). The glycemic index is a scale that measures how fast the sugar from plant foods is absorbed into the bloodstream and, consequently, how fast it raises blood sugar levels. Between 0-55 is a low GI. Between 55-69 is a moderate GI. Between 70-100 is a high GI. Ideally, diabetics should consume foods with a GI as low as possible which helps them achieve better control over their blood sugar levels. While certain brands of unsweetened pomegranate juice have been found to have a glycemic index of 53, which is technically still low, many other varieties have been found to have a moderate to moderately high glycemic index of 63-67, which is not good for diabetes. The juices with added sugars may very well have a high glycemic index. Not to mention that pomegranates vary in their sweetness and thus sugar content. The higher the glycemic index, the faster the sugars in the juice will be absorbed into the bloodstream and the more likely the blood sugar spikes. And the more fruit juice you drink with diabetes, or the more often you have fruit juice, the higher the chances of poor blood sugar control and insulin resistance. One small serving of fruit juice infrequently might not alter your health in a visible manner, but too much too often will surely do. Also see Can You Eat Pomegranate With Diabetes? Why does pomegranate juice have a moderate to moderately high glycemic index? When you extract the juice from the pulp, you also extract water-soluble nutrients, meaning B vitamins and vitamin C, minerals and, of course, sugars. But the fiber stays in the pulp. And in the case of pomegranate, the fiber is what slows down the absorption of the sugars and prevents blood sugar spikes – and the reason why the whole fruit has a low glycemic index. See Which Is Healthier: to Eat Fruits or Drink Fruit Juice? 2) Secondly, because it’s hard to limit intake so that you don’t exceed your daily maximum recommended intake of carbohydrates and sugar. All diabetics are advised to count their intake of carbohydrates and sugar so they don’t exceed a maximum recommended amount a day. This is to help them get control over their blood sugar levels and improve insulin sensitivity in diabetes type 2. Intakes of carbs and sugar are best established by a medical professional or a dietitian expert in diabetic diets. How many carbs and how much sugar in pomegranate juice? A very small serving of 30 ml of unsweetened pomegranate juice has an average of 4.1 g of carbohydrates of which 3.9 g are sugars (and no fiber). By comparison, a 100 ml serving of the unsweetened juice provides 13.13 g of carbohydrates of which 12.65 g are sugar (and no fiber). Juice from a more acidic, less sweet pomegranate fruit can provide 12.29 g of carbohydrates of which only 8.9 g are sugars. But both the sugars and the carbohydrates that are not sugar will be broken down quickly during digestion and contribute to blood sugar levels. Seen how quickly carbs and sugar add up in the juice, how difficult it is to stick to a lower-carb, low-sugar diet in diabetes and considering how good the juice is, excesses are bound to happen and this will reflect badly on blood sugar levels. How is pomegranate juice good for diabetes? 1) According to research, plyphenols (antioxidants) in pomegranate juice, such as punicalagin, have the ability to lower the glycemic response of high glycemic foods. This has lead researchers to believe drinking pomegranate juice may hold benefits for diabetics as well (Am J Clin Nutr. 2017 Dec;106(6):1384-1393). 3) Drinking a glass of pomegranate juice every day for 3 months may help improve blood cholesterol profile by reducing the uptake of LDL cholesterol by immune system cells, with possible long-term benefits for cardiovascular health such as a reduced risks of atherosclerosis. So can diabetics drink pomegranate juice? 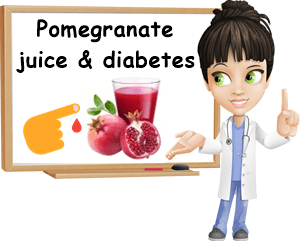 Yes, diabetics can drink pomegranate juice, preferably in limited amounts, infrequently, as part of an overall clean, varied and balanced diet. But it’s not necessarily good for them as there is nothing that guarantees including the juice in their diet, in whatever amounts, will produce any benefits at all. For diabetes to improve, the factors that matter most are overall clean, healthy eating, respecting the dietary restrictions of the condition, exercising to achieve and maintain a healthy body weight and access to essential medication. So despite promising research pomegranate juice is good for diabetes type 2, the juice will not cure the disease by itself and may actually produce side effects and complications when consumed in too high amounts or too frequently. But is pomegranate juice safe for diabetes? Any food really can be made safe to eat with diabetes. It’s all about how much (or little) of it you eat, how often (or rarely), how you combine your foods and how well you respect the dietary restrictions of your condition. For example, if you’re way below your daily requirements for carbohydrates and sugar, then sure, 100 ml or 3 oz of fresh, home-made pomegranate juice is likely OK. Moreso if you’re about to go for a walk or bike ride and exercise all that sugar (approximately 12.65 g of sugar in 100 ml of unsweetened juice) or have had a light protein meal or a very low-carbohydrate meal. The problem is that this can become a daily habit and, let’s be honest, how many people have the control to limit their intake to such small intakes when pomegranate juice is so good? So while studies suggest the juice may help with healthier blood cholesterol profile and keep arteries clean or lower the glycemic response of high glycemic foods, it’s still not the best choice for a diabetic diet, at least not when consumed every day or in large amounts. How much pomegranate juice per day is safe for diabetics? There is currently no official recommendation regarding intake of the juice for diabetics. Most medical professionals recommend against introducing fruit juices as regulars in diabetic diets, although very small amounts consumed infrequently may be well tolerated, without immediate or long-term side effects. The secret is to plan ahead for drinking juice (calculate your carbs and sugar intake for the day), only have small amounts, preferably after a light protein meal or low carbohydrate meal and not every day. Because while pomegranate juice is good for diabetes in theory, it also has properties that may cause side effects. Can You Eat Pomegranate With Diabetes? Can You Eat Grapefruit With Diabetes?